The Denver Barbarians host Park City Haggis on Saturday, March 30 at Infinity Park’s Turf Field located at 1055 S Cherry St, Denver, CO 80246. The match kicks off at 1:00 pm. The Barbos and Haggis participate in Rocky Mountain Men's Premiership League. We look forward to seeing you there. Support the Barbos and wear green. The Denver Barbarians take on the Denver Highlanders in two matches on Saturday, March 23 at Francis Wisebart Jacobs Park located at 1101 S Quebec St, Denver, CO 80224. The first match kicks off at 1:00 pm with the second match starting at 3:00 pm. The matches are part of the Rocky Mountain Men's Premiership and Rocky Mountain Men's Challenge League spring 2019 campaign. The Denver Barbarians take on the Denver Misfits in both teams’ first match of the spring 2019 campaign. Please note this is a Sunday match. The match takes place at Infinity Park Turf Field, 1055 S Cherry St, Denver, CO 80246 with kickoff scheduled for 11:30 am on Sunday, March 17, 2019. Wear green and white and support the Barbos. We look forward to seeing you at the match! Results: In decisive fashion, your Denver Barbarians Rugby came out on top against the Denver Misfits in this preseason game. Final score, 55-13! Man of the Match for the Barbos was Jason “Tubbs” Christensen. The Denver Barbarians take on the Denver Harlequins at Cook Park, 7100 Cherry Creek S Dr, Denver, CO 80224, in two matches beginning at 1:00 pm and 3:00 pm, respectively. The Barbos look to get back on track against the ‘Quins. We look forward to seeing you at the matches. Denver Barbarians travel to Boulder, CO for their first away game of the season. Two matches will take place at Pleasant View Fields Sports Complex located at 3805 47th St, Boulder, CO 80301. The first side kicks off at 1:00 p.m. while the second side begins their match at 3:00 p.m.
Make the short drive to Boulder and support the Barbos! Barbos begin their Aspen Ruggerfest schedule with a match against Utah Misfits on Saturday, Sept 15 at 12:10 pm on the Rio Grande Park Pitch located at the corner of N Mill Street and Rio Grande Place. The Barbos second match of the day kicks off at 1:50 pm against Jackson Hole at Wagner Park - 419 S Mill St, Aspen, CO 81611. We look forward to seeing you at the pitches. The Barbos and Highlanders began the fall portion of their 2018 - 2019 Rocky Mountain Rugby schedule on Saturday, September 8 at Frances Weisbart Jacobs Park. The first side won their Rocky Mountain Rugby Premiership League opener 49 -21 against the Denver Highlanders. The second side finished the day strong with a 29-19 victory in a Rocky Mountain Rugby Challenge League contest. The Barbos finished their 2017-2018 schedule undefeated in league play with their crowning achievement defeating all during the playoffs and winning USA Rugby's Men's Club National Championship! The Barbos second side was undefeated (7 wins - 0 losses) and champion of Rocky Mountain Rugby's Men's Challenge League. The Highlanders gained 4 wins against 5 losses in last season's Division II competition. Coach Brian Erichsen is returning many veteran players along with a number of others from college and other club programs from across the country. The Denver Barbarians win the Denver 7s Rugby Tournament and advance to the 2018 USA RUGBY CLUB SEVENS NATIONAL CHAMPIONSHIP in New York City as the #1 seed. This is the 24th appearance for the Barbos in the Championship Tournament. The Barbos pool includes Mystic River, Atlanta Old White, and Belmont Shore's second side. Flo Rugby will be broadcasting the tournament beginning at 9:00 am on Saturday, August 11 and continuing through the final match on Sunday, August 12. Follow us on Facebook as the Barbos progress through the championship playoffs..
Denver Barbarians Win National Championship! Huge effort today to come back from behind and win the National Championship Game!!! 39-38 over Detroit Tradesmen Rugby. Big ups and thanks to our opposition for a hard fought match! Also, THANK YOU #BarboNation for your immense support today in the stadium, couldn't have done it without you! More pictures to come soon. Bleed Green! Read USA Rugby's article about the match. The Denver Barbarians take on the Detroit Tradesmen to decide the 2018 USA Rugby Emirates Airline Club National Championship. Kickoff takes place at 2:00 pm on Sunday, June 3 at Infinity Park Stadium. Tickets are available online or at the gate. Adult: $10.00 13 years or older. Youth: $5.00 - 4 - 12 years of age. Children: 3 Years and younger are free. Join us in the Infinity Park parking lot, at the corner of E. Kentucky and S. Cherry St., before the game for a tailgate event. The club will be getting together after the match at the Rackhouse Pub - 2875 Blake St, Denver, CO 80205. Thank you to all members and supporters of the Barbo Nation, near and far. We look forward to seeing you as we compete for the National Championship! Wear green to the match. Day One in Fort Worth saw hot and windy conditions as the Denver Barbarians faced the Eastside Tsunami (for the first time in both clubs' history). The game started slow with many handling errors on both sides. The Tsunami played hard-running rugby to start, but had a mental lapse early and was penalized a red card for striking a player off the ball. Denver began to use the ball wide and find gaps in the Tsunami back line leading to two first half tries under the posts. But the Tsunami struck back before the half with a pair of scores, and it was knotted at the half with the Barbos leading 14-12. The second half saw six unanswered trys for the Denver Barbarians as their back line continued to display their athleticism and speed. Eric Sykes Jr. had a brace of tries, and the defense held against the persistent and continuous phase play by the Tsunami. There was one passage of play in the second half where the Tsunami attack went 25 consecutive phases before putting ball to deck. This game had large amounts of physicality, but it was Denver's speed that held the day. On Day Two, the rain poured in Fort Worth throughout most of the morning, making for a muddy field with high humidity levels. When the Denver Barbarians and San Diego Old Aztecs took the field at 1:30 pm for the D2 Western Final, the sun had come back out adding intense heat to an already humid atmosphere. The Old Aztecs defeated San Antonio the previous day in a high scoring match featuring impressive back play and pace. San Diego got on the front foot early, scoring two converted tries through their strong running forward pack. San Diego's Malaetasi Toilolo ran some powerful, prop-style running lines and gave the Barbo pack fits in the first 20 minutes. Denver needed a gut check before the end of the first half and got it with a trio of full length trys. However, San Diego chipped into space and regained the lead after collecting the high ball and dotting down before the half making the score 19-17 going into the final 40 minutes. But it was all Denver in the second half as the Barbarians rolled in seven second half tries as the team continued to utilize their speed and fitness to move the ball into open space and allow their play makers to capitalize. Team veteran and leader Michael Pisney commented on the weekend in Fort Worth. "We traveled to the Texas knowing that we had signed up for a fight. We also knew that we had the tools in the shed to handle just about anything thrown at us. The boys have been working hard on maintaining not just physical stamina, but mental stamina as well. When the Tsunami and Old Aztecs scored on us, we kept it together, regrouped, and utilized our cohesion to ride the wave and overcome these adversities." He elaborated on the club's growth during the 2018 season. "Over the past several years, the club has been working on enhancing a culture that breeds success through hard work, dedication, and commitment to the club. The vibe around the Barbarian horde at the moment is excellent, the boys are playing for the man next to them, not for themselves. I have never been more proud to be a Barbarian and I am looking forward to leaving everything on the field with my brothers on June 3rd in front of the entire Barbo family." See USA Rugby's article on the Western Championship playoffs. Read USA Rugby's recap on the Eastern Championship Playoffs. The Denver Barbarians travel to Fort Worth, TX for two matches in the 2018 USA Rugby Club Western Championships! The squad enters the weekend undefeated in league play with a record of 10 wins and 0 losses while outscoring their opponents 130 - 37 in their two playoff matches to date. Saturday's May 19 match against Eastern Tsunami, a Portland, OR squad, kicks off at 12:30 pm Mountain time. Click on Field 2 to watch the Barbos. The May 20 kickoff time will be determined after the first day's competition. We'll keep you posted. The Barbos defeated the St Louis Royals 56 - 30 on Saturday, May 5 earning the title of 2018 Frontier Conference Champions. The victory sees the team traveling to Harmon Field Park in Fort Worth, TX to face Eastside Tsunami in USA Rugby's National Quarter-Finals. The playoff brackets leading to the National Championship are illustrated on USA Rugby's website. In the 2nd minute of the match, Charles Ajarrista put Denver on the board with a penalty kick. St Louis would soon respond and at the half the Barbos led 22-13. Starting the second half, the Barbos produced four unanswered trys, giving them a 39 - 13 advantage, one from which St Louis couldn't recover. All Barbos received playing time and the team effort resulted in the win. Rocky Mountain Rugby provided a scoring summary by the minute. See their Twitter posts. Try scorers included: Eric Meyers, Michael Al-Jiboori, Eric Sykes with 3 trys, Eric Bloedorn, Brendan Shea, Carmine Hernandez, Michael Pisney. Charles Ajarrista provided all conversion kicks. The Barbos were joined during the National Anthem and in the post-match photo, shown above, by members of Aspire Autism based in Bloomfield, CO. Thanks to Matt Clement, fellow Barbo, for his trumpet performance. The Barbos, Rocky Mountain Rugby's Champion, by way of defeating Park City Haggis, 71 - 7, face the St. Louis Royals, Mid-America Champion, on Saturday, May 5, 2018 at 3:00 p.m. for the Frontier Conference Championship. The match takes place at Infinity Park Turf Field, 1055 S Cherry St, Denver, CO 80246. The winner of this match travels to Ft. Worth, TX the weekend of May 19 - 20 to decide USA Rugby's Western Champion. There was a very good showing at the Barbo/Park City match. Let's top that! Wear green to the match and support the Barbos as they continue their playoff run! We look forward to seeing you there! View the Frontier Division's standings and results for the Barbos and Bombers here. The Denver Barbarians, undefeated in league play, took on Park City Haggis, Saturday, April 28, to determine the Rocky Mountain Rugby Champion. Solid defense and an explosive offense saw the Barbos win the match 71 - 7. While Denver found the try line at 3 minutes, it wasn't until the 20 minute mark that another try was delivered by the Barbos. At that point, the Barbarian offense added a try, on average, every 4 1/2 minutes. Half time saw the score at 31 - 0. Head Coach Brian Erichsen, member of Canada's 2011 Rugby World Cup Squad, has led the Barbos throughout the season. The players, old boys and supporters congratulate him on his stellar performance. Introduce yourself to Coach Erichsen following this weekend's match or at any number of upcoming social events. The Denver Barbarians (10 wins - 0 losses) take on Park City Haggis (6 wins - 4 losses) to determine the team that will represent Rocky Mountain Rugby in the run for USA Rugby's National Championship. The winner of this match will face the Mid-America Champion on May 5, 2018 in Denver, Colorado. Wear green to the match and support the Barbos as they begin their playoff run! A Night at the Races is the annual fundraiser for the Denver Barbarians Rugby Club; it is a night to introduce new people to one of the oldest and most storied rugby clubs in the United States and strengthen our place in the Denver athletic community. For more information, please contact: Jake Berlin (jacobdrew92@gmail.com) or Kevin Gauthier (gauthier.kevin.p@gmail.com). See the event posting on Facebook. The Barbos, continuing their winning ways in the Rocky Mountain Rugby Union, won two this past weekend, April 7, 2018, with the first side winning, 45 - 15, against an always tough Park City Haggis. The second side offense ran away from the Colorado Rush, 102 - 15. The Barbos have two matches on Saturday, April 7, 2018 at Infinity Park Turf Field. The first match pits the undefeated Barbos against Colorado Rush with kickoff taking place at 10:00 a.m. The second match features the undefeated and first place Denver Barbarians against Park City Haggis. Kickoff takes places at 12:00 p.m.
Robert Paylor, a rugby player at the University of California, is returning to California to continue his studies. He has spent the past nine months at the Craig Spinal Rehabilitation Center in Denver. Please join Robert, his family and friends, April 4, 2018, from 5:00 p.m. - 10:00 p.m. at the Three Lions Pub located at 2239 E. Colfax Ave, Denver, CO 80206 and/or consider making a donation to Robert's GoFundMe page. Robert's YouTube video is available here. Only rugby people can take care of their own like we can. The Barbos wish Robert all the best during his recovery! The Denver Barbarians were in overdrive as the first side and second side teams put up 88 and 122 points, respectively, against the Denver Harlequins in two matches on October 28, 2017 at Cook Park in Denver, Colorado. The first side scored 14 tries and had nine conversions while the second side scored 20 tries and had 11 conversions. First side players that scored tries included: Matt Clement – 1, Antwun Barker – 2, Gabe Bram – 2, Carmine Hernandez -1, Mark DeGuire – 1, Evan Geist - 2, Michael Al-Jiboori – 2, Eric Bloedorn – 1, Eric Sykes, Jr. - 1, Charles Ajarrista – 1. Lance Eberhard had nine conversions. 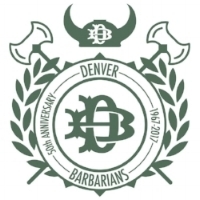 The Denver Barbarians are coached by Brian Erichsen and Dan Bludeau. The Barbos lead Rocky Mountain Rugby's Men's Senior Club competition at the midpoint with five wins and no losses. League competition begins again on March 17, 2017. #12 - Eric Sykes, Jr. The Barbos (4 wins / 0 losses) play the Denver Harlequins in two matches on Saturday, 28 October, 2017 at Cook Park, 7100 Cherry Creek S Dr, Denver, CO 80224. The Division II match begins at noon followed by the Barbos and Harlequins D4 match starting at 2:00 p.m.
Join the teams, after the games, at the College Inn located at 4400 S. 8th Ave, Denver, CO 80220. The Barbos, leading their Rocky Mountain Rugby division, go to four wins and no losses following a close match with Park City Haggis Rugby. Trailing at the 72nd minute, Charles Ajarrista, with one minute left on the clock, scored and converted his try to seal the match for the Barbarians, 26 - 24. Denver was first, at the 2-minute mark, to score with Amani Griffith touching down for his first of two tries on the day. Charles Ajarrista converted and the Barbos led 7–0. Park City followed with an unconverted try to make it Barbos 7-5 at the 32nd minute. Antwun Baker, minutes later, scored and the Barbos extended their lead to 12-5. Ajarrista’s conversion made the score 14-5 at the 35-minute mark. At 40 minutes, Park City scored, missed the conversion kick and at the half the Barbos led 14-10. Amani Griffith, five minutes into the second half, scored again for the Barbos and after Ajarrista’s conversion, the Barbos held a 19 – 10 lead. The Haggis, within minutes, scored and converted bringing them to within striking distance at 17 – 19 with the Barbos holding a narrowing lead. Park City Haggis took their first lead in the match, 24 – 19, at the 72nd minute following a try and conversion. With the game on the line, in the 79th minute, Charles Ajarrista made the game winning try and conversion bringing the score to 26 – 24 at the final whistle. Denver Barbarians Rugby remain undefeated winning 71- 12 against the Denver Highlanders in their first meeting of the 2017 / 2018 Rocky Mountain Rugby Division II season. Charles Ajarrista began the scoring for the Barbos at the eight-minute mark. Michael Al-Jiboori, on his way to another hat trick on the day, followed up by scoring a try a few minutes later and scored two more trys within the first 50 minutes. For the day, the Barbos dotted down 10 trys. Try scorers were Charles Ajarrista - 1, Michael Al-Jiboori - 3, Landon Peterson - 1, Gabe Bram - 1, Antwun Baker - 2, Brendan Shea - 1 and Crispin Estevan with 1 try. Charles Ajarrista had 7 conversions and 1 penalty kick while Lance Eberhard completed the day's scoring with a conversion kick. In Division IV competition, the Denver Barbarians team defeated the Denver Highlanders by a score of 29 - 14. The Barbos scored five tries while the Highlanders had two tries. The match was tied at the 50 minute mark when the Barbos reeled off three tries to secure the game. The Barbos travel to Utah for a match with Park City Haggis on Saturday, 14 October 2017. The Barbarians are in first place in the Rocky Mountain Men's Senior Club Division 2. The undefeated Denver Barbarians take on the undefeated Denver Highlanders at Francis Wisebart Jacobs Park, 1069 S Oneida St, Denver, Colorado 80224 at 3:00 p.m. and 4:30 p.m. on Saturday, 7 October, 2017. Two matches will take place with the Barbos A-side kicking off at 3:00 p.m. followed by the B-side taking the pitch at 4:30 p.m.
Saturday's a rugby day. Bleed Green! Join the teams after the matches at the Pioneer Bar located at 2401 S University Boulevard, Denver, Colorado 80210 at 6:00 p.m. for a beer and a bite to eat. The Barbos defeated Boulder Rugby at Pleasant View Fields Sports Complex Championship Field in Boulder on Saturday, 30 September 2017 by a score of 85 - 5. Dominating on offense and defense, in a team-effort, the Barbarians scored 13 trys and converted 10 times. Barbos who scored included: Landon Petersen – 1, Antwun Baker – 2, Eric Sykes, Sr. – 2, Michael Al-Jiboori – 3, Charles Ajarrista – 2, Mike Pisney – 1, Jason Christensen – 1, Eric - 1, and Ryan Walker - 1. Charles Ajarrista had nine conversions and Devin Martling contributed one. The Barbos take on Boulder Rugby in two matches on Saturday, September 30 at Pleasant View Fields Sports Complex, 3805 47th Street, Boulder, CO 80301. The Barbarians A-side tackle, in a Division II rivalry, Boulder's A-side at noon. That game is followed, starting at 2:00 p.m., by the Division IV Barbos B-side facing off against Boulder's B-side. The Barbos began their Fall/Spring 2017 Matches with a victory, 36 - 24, over the Glendale Merlins at Infinity Park. The Barbos begin their Aspen Ruggerfest play on Saturday, September 16 at 8:00 a.m. at Wagner Park Rugby Stadium in Aspen, Colorado. Their second game on Saturday is scheduled to start at 11:00 a.m. at Rio Grande Park against Gosling Golds. Rio Grande Park is at the intersection of N. Mill Street and Rio Grande Place, a short walk from Wagner Park. Ruggerfest begins on Thursday, September 14 with Old Boys matches. Please see the Ruggerfest website for a complete listing of games that take place on Thursday, Friday, Saturday and Sunday. Are you driving to the tournament? Please read this travel advisory. For those driving from Denver and the front range, Ruggerfest suggests entering Aspen via Independence Pass. Denver Barbarians defeat Glendale Merlins 36 -24! Next Up: The Barbos travel to Aspen for the 50th Annual Aspen Ruggerfest Tournament. The Barbos play their first match of the Fall 2017 season against crosstown rivals, the Glendale Merlins, at Infinity Park Stadium beginning at 1:00 p.m. on Saturday, 9 September 2018. Join us at the match as we celebrate this first game of the season and the Barbarians 50th Anniversary! The Barbos roster for the match has been announced. The Denver Barbarians secured their ticket to the 2017 USA Rugby Emirates Airline Club 7s National Championship this past weekend via a tournament win at the Lincoln 7s, the third and final Frontier Region Qualifier of the summer. The Barbarians put together their most comprehensive performance to date, dispatching the 2016 Sevens National Champion, Rugby Utah Selects National Development Academy (NDA), in pool play 24-7 and 31-19 in the final. There were several standout performances and Michael Al-Jiboori was named MVP on the day for his exceptional play, highlighted by his suffocating defensive effort. The Barbarians Premier side completed the 2017 summer regular season with 16 wins and 2 losses, by a combined 4 points, through four tournaments leading to two tournament championships. As a benefit of competing in one of the toughest regions in the country, the Barbarians will enter the 2017 USA Rugby Emirates Airline Club 7s National Championship as the second seed. The Barbos A-side also competed in the qualifier bracket in the three Frontier Region tournaments garnering third, fourth and fifth place finishes. 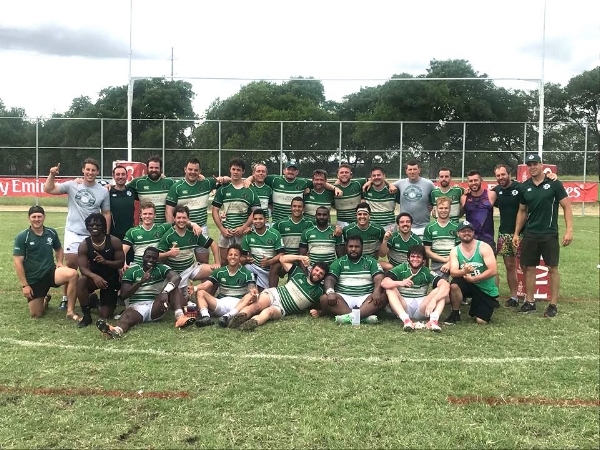 The summer sevens season provided opportunities for player development and competition as two Barbo teams participated in each of the Frontier 7s Qualifiers. The player development through the summer was evidenced by the fact that two players started for the second side in the first tournament of the season and progressed through the summer to make the Premier side, where they played significant roles in the recent tournament championship in Lincoln, NE. The hard work of the players and coaches has not only led to a trip to Nationals, but has garnered individual recognition for four players. Michael Al-Jiboori, Cody Melphy, Devrin Young and Dominic Rufran were invited to the High Performance 7s Incubator Camp at the Olympic Training Center in Chula Vista, CA. Additionally, it has recently been announced by USA Rugby that the Denver 7s program, which the Denver Barbarians are heavily involved with, has been recognized as a National Development Academy (NDA). The Barbarians would like to thank our premier sponsor Spyder for their continued support. The Barbos travel to Fleming Fields, Lincoln, NE for their final opportunity on Saturday, July 22, to qualify for the 2017 USA Rugby Emirates Airline Club National Championships. Barbos must finish the tournament ahead of the Kansas City Blues to take the Frontier Division #2 seed to the nationals. Two sides are making the journey to Lincoln, NE. Rugby Utah Selects have already qualified in the Men's Division by virtue of their wins at the Denver 7s and Heartlands 7s tournaments. The Aug. 12-13, 2017 USA Rugby Emirates Airline Club 7s National Championship will take place at the National Sports Center just outside of Minneapolis and every match at the 2017 Club 7s National Championship will air live on The Rugby Channel. The Barbos are coached by Steve Laporta, Jason Kelly and Tyson Meek. Denver Barbarians unveiled our new sponsor SPYDER in San Diego this past weekend. The Barbos opened the tournament with a 27-0 win over Santa Monica. Ke'Von Williams scored a hat trick in the first half and his Vato Alumni teammates Jeremy Misailegalu and Eric Sykes each dotted down in the second half to make it an all-Vato scoring affair. Barbos beat OMBAC 19-0 in game #2 on the back of two trys by Michael Al-Jiboori, one from captain Ke'Von Williams and two conversions from Nick Boyer. The Barbos beat LA Rugby Club 47-0, to win the pool with a point differential of 93-0. Devrin Young had a break out game with a hat trick, while Nick Boyer continued as Mister Consistent. Barbos beat OC Ravens 24-17 to advance to the final against Belmont Shore. Celester Asuega had a special performance that started with a great effort to chase back 40 meters to retrieve a kick followed by a length of the pitch jinking run to score under the posts. Tim Hanify made a big effort support run to ensure Celester made it to the line. Barbos beat Belmont Shore 19-5 to win the first tournament of the year. Celester started off the scoring with a nice try, and the Barbos went into the half with a 7-5 lead. Trys by Michael Al-Jiboori and Jeremy ‘Missile’ Misailegalu and solid defense sealed the victory. The scoring effort on the day was pretty balanced with Ke’Von and Missile each crossing the white wash 4 times, while Michael, Sykes, Devrin and Celester each dotted down 3 times with Nick Boyer adding two trys to his iron man performance. There were great defensive efforts from the guys throughout the day and some exciting performances all around. Thanks as always to CrossFit Broadway for the continued support and to Steve Laporta of HomeSmart Cherry Creek for his sponsorship this season. It’s great to have coaches who not only volunteer their time, but also sponsor the team.